We supply All Glass Water Distillers with metal heater or Silica heater in different capacities to meet the requirements of research institutes, laboratories and industrial sectors. The advanced design, safe use and less maintenance make these distillers most sought after amidst our quality conscious clients spread all across the globe. 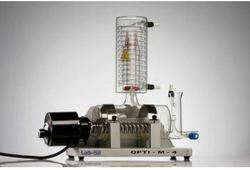 We bring forth a range of Water Distiller with metal heater and silica heaters in model OPTI-M. Elegantly designed, these are available in different capacities to meet the requirements of research institutes, laboratories and industrial sectors. These water distillers produce highly treated and disinfected water. This distillation process helps in removing minerals and microbiological contaminants and can reduce levels of chemical contaminants. Made in compliance with international norms, our range of water distillers are known for their safe use and less maintenance. Sufficiently more output: The Still yields an output of 4 Ltr/hr of distilled water for a Power consumption of 3kw through a metal heater (chromium plated), which is mounted inside a horizontal Glass Boiler. The output temperature of the Still is 30° C to 40° C (approx) which is taken care by efficient cooling by coiled Borosilicate condenser. The unit has two portions, one Boiler and the other Condenser. The unit is mounted on a sturdy metal stand. The Boiler is provided with TEFLON screw cork for easy cleaning of the boiler. 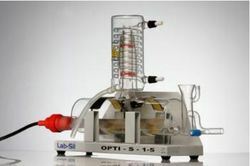 Quality of Distillate: Best for general laboratory usage. 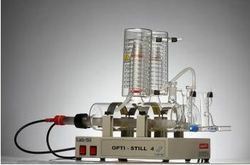 The above quality of distillate is obtained by using treated water as boiler feed. All rubber tube connections can be made with threaded connectors. All Glass construction with silica heater ensures high purity PYROGEN Free distilled water . The unique condenser design ensures that the droplets of distilled water remains in contact with cooling coils for the longest possible time producing cold distilled water and preheated boiler input which increases efficiency of the unit. All silica heaters are provided with silicon bunks for easy, safe and quick assembly of the silica heater. Screw threads are incorpared on all water connections so as to facilitate easy fitting and removal of hoses to avoid risk of breakage. Built in acid funnel and Teflon drain stopcock to allow easy decaling without dismantling the glassware's. All Glass construction with silica heater ensures high purity PYROGEN Free distilled water at an very economical price tag. Looking for Borosilicate Water Stills ?